Madison is your typical seventeen year old girl. Well she would be if she were alive. Now in addition to all the normal teen stuff, she has to deal with learning to control the amulet that she stole in order to "live." She also doesn't need to eat or sleep, which can be a little hard to hide at times. She is still on the run from the Dark Reaper that targeted her. Something is a little fishy since she is already dead and he should have no use for her anymore. She will have to stand up and fight if she wants to continue on with the illusion of a body. This is one girl who will not "go gently into the night," she will fight to the bitter end despite what fate tells her. Madison is a really unique character. Of course the fact that she is dead might have just a little to do with that. She dresses ecentrically and her hair has purple tips. While she says she wants to fit in, she never really makes an effort to, making me think she only says it because she thinks she should want to. She is very gutsy and never hesitates to step right into the action. Of course she is a typical teenager in that she doesn't always think things through making her more than a little reckless. I see a lot of potential for her character to grow. This became especially apparant as things were revealed and the reason behind her survival. Her "role" is sure to make things quite interesting in the long run and I can't wait to see what she gets herself into next. I didn't really care for the way we were thrown into the middle of Madison's world without much of an explanation or back story. It took a while for things to start to be revealed. I just found out there is a short story in the anthology, Prom Dates From Hell, that shows Madison's death. Perhaps if I had read that, the begging of this one wouldn't have felt so jarring. I also wish the Fate vs. Choice concept had of been more prevalent earlier on and I found it to be really interesting. However, I do think I will get my wish in the next book as things were really well set up for those issues to play a larger role in the future. 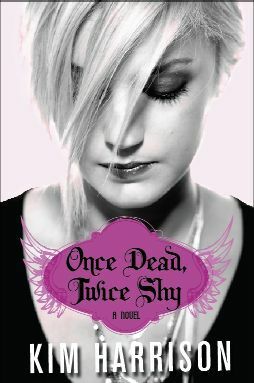 Once Dead, Twice Shy has a great cast of characters, and the dynamic between them is what really made the book. I really enjoyed the ending as it really solidified those relationships, and made me very eager to read the next book. I absolutely cannot wait to see how the motley crew figures out how to work together without tearing each other apart, no small task when you consider just how different they all are. While this book may not be quite up to the caliber that Kim Harrison's other series, The Hallows is, it was definitely an enjoyable read, and I look forward to reading the next installment.